This method aims at proportionately investing in various asset classes and the return is determined by the average of returns in various categories. For example, if equity funds have generated historically a return of 15% per annum and debt funds have generated a return of 10% per annum and various bonds and securities have generated a return of 7.5%. A mix of 33.3% equity funds, 33.3% debt funds and 33.3% in bonds and securities could potentially generate a return of 10.84% per year. Such a strategy focuses on capitalizing short term opportunities. As per the market timings the assets are shifted to the more favourable asset class for the short term profit. It requires moderate active management on the part of the fund manager. Once the short term profit has been achieved the investments are restored to the original asset allocation. How would your meal taste if you added just one ingredient? A little bland and a whole lot unappetizing! You cannot have a meal with one ingredient because it is not complete. Similarly your investments remain incomplete if you invest in just one asset class. Depending on your personal goals you may require a fixed corpus in both long term and short term. As an investor, if you are investing only in debts you will get moderate return with exposure to moderate risk. If you are investing in equities then your investments are volatile but you can potentially earn higher returns. It can also put your investments at risk. In case you make losses that can indefinitely defer your short term goals and will also affect your long term goals. It is also necessary that you have some cash at hand and cash equivalents which can easily give you access to liquid cash. Asset allocation is largely decided by your age, risk taking appetite and investment goals. To young in the age group of 21-30 years investors, it is usually advised that they invest in equities more heavily and to balance out the risk posed by equity investments, investments in debt are to be made. To middle aged investors 31-45 years, they require security as well as returns. Hence, equal importance has to be given to equity and debts. Investors nearing the retirement age of 60 years require security of capital. Hence, they are encouraged to increase debt investments and focus less on equity. There is no hard and fast rule neither a sure shot formula to find the perfect asset allocation. Asset allocations are created on individuals needs. Here are some examples of asset allocation. Four situations have been analyzed with varying age groups, risk appetite and investment horizon. 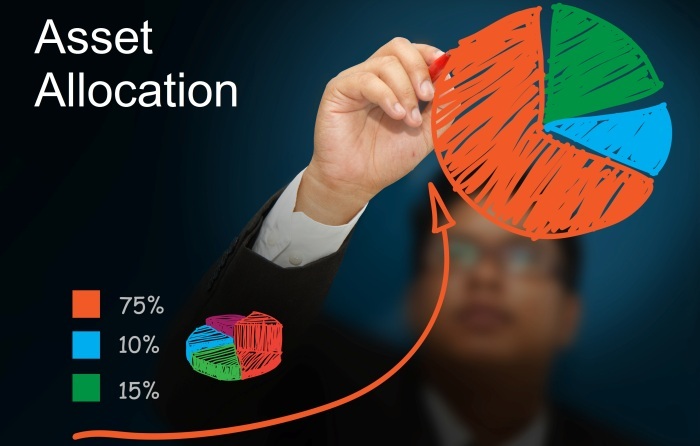 Asset Allocation Funds usually have a predetermined strategy for equity and debt investments. Investing in such funds, to the large extent, do away with need to do asset allocation. As an investor you do not have to actively manage your fund as they are passively managed by the fund house. The adjustments in the assets may be made from one class to another depending on the market conditions. Such funds are usually ‘feeders’ where you invest in equity funds and debt funds of the same Asset Management Company (AMC). The assets are managed by fund managers who are experts and can gauge the pulse of the market. The funds have often been criticized to make adjustment according to the market environment. These funds are not customized to the needs of the investors and do not take their personal goals into consideration. An investor might require fulfilling a short term goal in three or five years but the fund in which he has invested shifts the asset to a debt fund and therefore the return may not be generated. These funds are assigned on the basis of mathematical formulas and historical returns. A change in investor's goals, lifestyle, net worth and even his risk-taking ability are not taken into consideration. Pros and cons are two sides of the same coin. While the asset allocation funds may not be taking personal needs into consideration, some of the funds have been generating high returns. Here are some examples of asset allocation funds and the returns they have generated up to ten years. The category return has also been mentioned at the end. Through this we tried to shed some light on the importance and need for asset allocation through mutual funds in an investors financial life. Asset allocation has to be actively pursued by an investor for the larger part of his investing life. Experts emphasis upon the fact that more than the selection of the individual funds, it is asset allocation that determine the returns of a portfolio. Whether you want to carry out asset allocation or invest in an asset allocation fund is best determined by your needs and risk taking ability. An advice from your financial adviser could facilitate the decision making in your best interest.